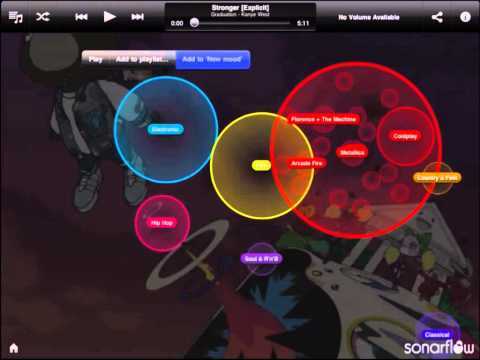 SonarFlow (free or $2) offers a new window into your own music collection by displaying it graphically as bubbles, offering a new way to unearth hidden gems. At a glance, you can take in a map of your music, with circles representing genres, any of which become playlists when you tap them. You can pinch the screen to expand any genre into circles representing artists and genres, which makes scrolling through a long list of music seem like an anachronism. You can add any of this stuff to a playlist with ease, simply by holding down a circle, while a playlist editing option lets you prune a playlist down, if a particular song has overstayed its welcome. If the app works as well for you as it did for me, you’ll uncover some long-lost favorites, which you can share via Facebook or Twitter from within the app. And the app lets you play any of your tunes on stereos via AirPlay. The thing is, in order to take full advantage of SonarFlow, all of your music needs to be tagged with the proper genre. Otherwise, lots of your tunes will end up in an unhelpful circle called “Other.” The fix for this, unfortunately, is either to correct all the genre tags in your collection manually (which you can by right-clicking or CTRL-clicking the songs in iTunes or other desktop players) or purchasing something like TuneUp, which can fix the tags automatically. If your genre tags are in order, and you have lots of music on your iPad, iPod Touch, or iPhone, SonarFlow’s interactive, visual approach to music organization could be just the thing. We enjoyed it. However, unless you pay $2 for the pro version, you’re stuck with the ad-supported version, which only lets you make two playlists. Still, even that version lets you discover what’s in your bubbles, and could help you fall in love with some old favorites all over again.